Although rare, a dog can develop a darkening color under its leg creases. The cause is usually a reaction to the season, obsessive scratching and biting, or to the sun. However, a darkening color to a dog's skin can also signal that there may be another problem. Sometimes the season can be to blame for a dog's darkening skin, especially on the flanks. Cyclic alopecia, or seasonal flank alopecia, is a growth cycle involving the hair on a dog. The hair growth will tend to stop at certain times of the year, particularly on the dog's back and flanks. However, hair loss is sometimes not the only sign. A darkening to the skin on the flanks of the dog can be the most prominent sign of this kind of seasonal disorder. Another reason a dog's skin color might change is from biting and chewing. The most common explanation for a dog to itch is allergies. Allergies from pollen, food and fleas make a dog chew, scratch and rub obsessively. This kind of irritation of the skin can cause a darker tone to develop on the skin. Certain pests, such as chiggers or fleas, have a tendency to be the worse on the belly and in the folds on a dog's skin, causing the dog to scratch which can cause the skin in the crevasses to darken. Yeast or bacterial infections can also cause a dog to scratch and bite. Just like humans, dogs can suffer from sunburn. The purpose of dogs having thick hair, even in the summer, is that it protects the dog's skin from the sun. However, on the stomach and at the top of a dog's thighs where the fur is less thick, sunlight can cause an irritating rash. The burn itself can cause a blackish tint to the skin in some dogs and might also darken if the dog irritates the rash further, such as scratching it. Sometimes a darkening of the skin can be a warning sign of a more invasive problem. In puppies, growth hormone responsive alopecia can cause skin to darken on the thighs. 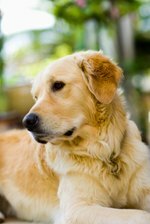 Hair loss usually accompanies this kind of disease and typically affects in a dog less than two years old. Hyperestrogenism, a rare disease in female animals with excess levels of estrogen, can also cause the skin on a dog to darken. This kind of disorder can be accompanied by cancer on the ovaries which should be taken seriously. If pests are to blame for a dog's darkening skin, medication or pest collars can keep the pests from causing the dog to itch. Medication also treats allergies in most cases. Infections, diseases, and conditions are not as easy to treat. 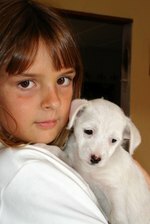 Only a veterinarian can properly diagnose an animal and administer the proper treatments.